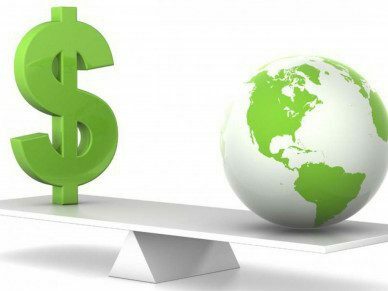 The global economy has pushed the limits of linear consumption so far that the question as to whether or not we can sustain our current model of economic development is one that can no longer be ignored. The current economic model of development, based primarily on linear growth, has been criticized on the basis of an overwhelming fixation on profitability, GDP, and labor productivity as indicia of success. GDP growth has long been the natural goal of many different societies across the globe. Many postulate that in our world anticipated to grow to 9.7 billion humans by 2050 (United Nations, 2015), the current GDP growth rate cannot continue at its current pace, as such a pace will deplete much-needed nonrenewable energy and material resources. Somewhat paradoxically, energy production is both a determinant of economic growth (e.g. through revenue generation and positive employment), as well as an instigator of harmful environmental effects. The fundamental question that must be asked is if it is possible to simultaneously increase economic growth and advance environmental and social prosperity. The first widely recognized intuition of the potential negative effects of exponential economic growth was introduced to the world in the form of a novel, “Limits to Growth,” written in 1972 by Donella H. Meadows, Dennis L. Meadows, Jorgen Randers, and William W. Behrens III. Limits to Growth used system dynamics theory and the World3 simulation model to examine the consequences of exponential economic and population growth, specifically analyzing twelve scenarios of different environmental outcomes from global development over two centuries: 1900 to 2100. The conclusion was that the world had already overshot* many of our limits and that business-as-usual would result in an eventual global collapse in the 20th-21st century from resource constraints and increasing pollution, including hazardous effects from climate change. While the book was criticized by academics, economists, and businesspeople for the methodology, projections, and conclusions, four decades later, in 2014, The Guardian published an article discussing a Dr. Graham Turner who had gathered data from the United Nations, the Food & Agriculture Organization, the U.S. National Oceanic and Atmospheric Administration, and many other sources, in order to test the Limits to Growth scenarios. The results showed a world very closely matched to the “business-as-usual” scenario espoused in the book: the data was strikingly similar to the forecasts put forth in Limits to Growth. While sustainable degrowth is not synonymous with GDP degrowth, sustainable degrowth should ultimately lead to the natural decline of GDP. It is important to note that the argument for sustainable degrowth is not synonymous with an argument for negative GDP growth. Rather, degrowth can and should, as hypothesized by Kallis, increase welfare and improve environmental conditions under the appropriate conditions and policies. The chief concern of the degrowth movement is the manner in which GDP can decline in a socially and environmentally sound way. The degrowth defense is not an argument for recession; rather “a vision of a smooth process of downshifting the economy through institutional changes, managing collectively a ‘prosperous way down'” (Odum and Odum). One answer, it seems, is selective degrowth, such that resources are redistributed between public and private consumption and even between generations. Selective degrowth is complex. Who decides which consumption activities should and should not continue to grow? The government? The people? A third party environmentally-focused organization? Someone else? This so-called selection cannot be left to market forces alone. Kallis argues that degrowth will only be possible through radical institutional changes, such that the resulting system can no longer be called capitalism. It seems reasonable to conclude that the capitalist markets we live among today will not voluntarily choose the path of degrowth. The market tends to avoid or ignore risk until faced with abrupt crisis: a lost lawsuit, legal predicament, or act of violence. The terrifying question that is unaddressed by most researchers is what it will take to spur action. What catastrophic event needs to occur to shake the markets awake? The green economy crowd believes that the green economy has the potential to create and accelerate meaningful and revolutionary change towards sustainable development. The movement suggests policies and incentives to create a low-carbon state of economic activity. Yet, other equally-as-adept economists contend that green growth will be inadequate to achieve sustainable development. Sylvia Lorek and Joachim Spangenberg express their doubt as such: “Green economy/green growth…is a new terminology for what is known since 40 years as ecological modernization. It is indeed overdue, but with its focus on efficiency and innovation, it cannot guarantee to fulfill the Brundtland sustainability criteria. A factor analysis based on the I*P*A*T formula demonstrates how optimistic the assumptions regarding future technologies must be to support the green growth concept.” Lorek and Spangenberg argue that “green growth” is nothing more than a buzz phrase, and a true sustainable economy is formed by a society that lives within its ecological boundaries. As such, sustainable economies are formed through sustainable forms of consumption, including the resource consumption necessary for production. Efficiency gains are needed along supply chains in addition to, and not instead of, living and working conditions which allow for a “decent life”. Importantly, a sustainably-developed economy shifts resources and meets the needs of everyone. In 1987, the World Commission on Environment and Development defined a sustainable society as: “one that meets the needs of the present without compromising the ability of future generations to meet their own needs”. The idea “bigger is better” is a mantra of the past. Economic progress is being redefined, as businesspeople, policy makers, investors, and consumers are beginning to realize that our current model of linear consumption has pushed the boundaries. What, then, is the best way forward? A multifaceted government approach focused on both a green economy and selective degrowth is necessary in order to achieve the careful balance of simultaneous economic growth and environmental/social prosperity. Market prices are key. Incorrect prices produce too much or too little and do not maximize utility. Government is needed to adjust prices to reflect real costs (including externalities), whether by tax or subsidies or both. Government could ration or restrict resources, which would effectively raise prices. Mandating miles per gallon for car manufacturers would, for example, raise the price of the gas guzzlers relative to efficient cars to inventive the adoption and manufacturing of efficient vehicles. Similarly, a carbon tax on emissions would raise the price of carbon. However, raising prices does not lower overall utility. A shift in tastes might be needed, such that people value doing good by the environment. Social advertising might be necessary to shift utility curves. In such a price-adjusted economy, the poor will get hit the hardest. The rich can afford the Tesla, the poor cannot. In a global context, what is needed is a reallocation of resources from the “haves” to “have nots”. Subsidies are a must. Incentive structures (taxes, subsidies, penalties) to punish negative environmental behavior. Government could shift the allocation of capital away from energy-inefficient industries and towards industries and businesses that are contributing to a green economy. While both positive and negative incentives should be in place, taxes and regulations are imperative, such as a tax on carbon emissions. This is a complex proposal, to be discussed in further detail in a future blog post. Access is also important, such as policies that make aspects of a sustainable lifestyle convenient at the local level: ease of recycling, infrastructure for public transportation, encouragement of ride-sharing or reusable items in a society. Employment research (Ashford, Kallis) suggests that a shorter work week can potentially lead to a more sustainable future through higher productivity, less energy-intensive activities (including, for example, commuting to work) and happier employees. Government should also lead by example, exerting positive low-energy activity, as well as serve to put policies in place to strengthen the community. For example, government could establish community projects around urban planning, community clean-up projects, and/or community-based renewable energy projects. Projects should focus on the sharing and limited use of energy sources. Actions at the community level play a crucial role, as such actions can stimulate changes at the national level, either by community-applied political pressure, or by setting examples of successful local implementations of policy. A sound policy must focus on strengthening local economies. Health, Education, and Natural Resource Protection are imperative for a prosperous society and aforementioned multifaceted government approach must also set policies in place to increase access to health and education, and to preserve species. Resource reallocation towards the developing world is vital, as today’s largest economic issues include increasing unemployment, and heightening income, poverty, and education gaps. Government should strive to decrease the pervading economic inequality between the developing and developed world. While fossil fuel and energy intensive activities should still be regulated in developing economies, it is clear struggling nations need political help. One suggestion would be to create maximum production ceilings for certain energy-intensive industries. In this way the developed world, already likely hitting such ceilings, would be forced to curtail production and consumption, allowing the developing world to catch up. Another important policy implementation for the developing world is subsidies, such as those in place to help foster easy trade and access to resources. Note the above policy suggestions are just a brief overview of suggested regulatory changes, barely scratching the surface of the intricacies of each, but for the context of this already very long blog, hopefully sufficient. It should be noted that such recommendations fall short in mentioning the utter complexity in implementation, particularly across geographies and classes. There is a school of thought, oozing with skepticism, that no matter what actions are taken from here on forward, the amount of carbon already emitted in the air, and the amount of human-contributed environmental destruction, is too vast. That nothing can be done to reverse the damage that’s already occurred. This thinking is faulty, as it only leads to inertia. This what’s-the-point mantra will lead to our eventual demise. We must move forward. It is not too late and there are amazing sustainable initiatives being implemented across the globe, as well as countless missed opportunities created mostly by lack of knowledge and/or effort. The adoption of rapidly improving technology, business incentives aligned with environmental friendliness and social prosperity, shifting mindsets at the community level regarding consumption and production habits, and appropriate regulatory procedures in place can and will help mitigate the current climate crisis. No one stakeholder can “solve or fix the climate crisis” alone, a collective group effort is needed. The future of humanity is dependent upon this. *To overshoot means to go too far, to grow so large so quickly that limits are exceeded. When an overshoot occurs, it induces stresses that begin to slow and stop growth. The three causes of overshoot are always the same, at any scale from personal to planetary. First, there is growth, acceleration, rapid change. Second, there is some form of limit or barrier, beyond which the moving system may not safely go. Third, there is a delay or mistake in the perceptions and the responses that try to keep the system within its limits. The delays can arise from inattention, faulty data, a false theory about how the system responds, deliberate efforts to mislead, or from momentum that prevents the system from being stopped quickly” (Limits to Growth, 1972). But, a culture of curbing growth may be difficult to achieve. You may enjoy the reading the works of a different Turner on westward expansion and American culture.